Rediff.com » Movies » His first film made Rs 175 crores! 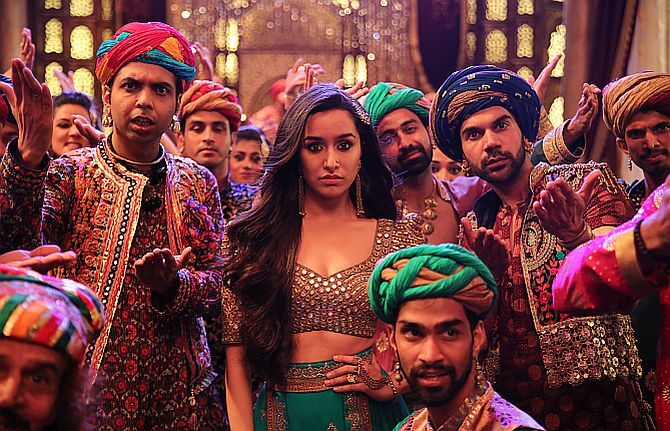 IMAGE: A scene from Stree. How does a film with a budget of Rs 24 crores (Rs 240 million) earn Rs 175 crores (Rs 1.75 billion) and counting? In an era where movies are yanked out of theatres quicker than Trump's tweets are refuted by the White House, Stree, which released on August 31, is still going strong in movie halls more than six weeks later. 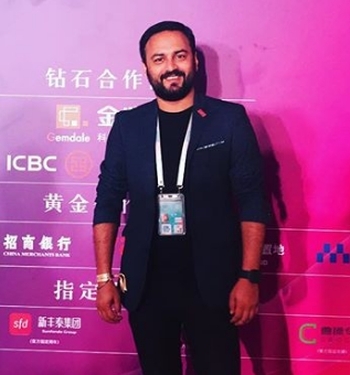 Director Amar Kaushik, humble and down to earth, confesses, "We didn't know it would do so well and connect with the audience so much." "12 years after I came to Mumbai I have delivered my first baby," Amar tells Rediff.com's Patcy N.
Congratulations! Did you think Stree would be such a big success? Our motive was to make a good film. We wanted people to connect with the film. The scripting was good, the shoot was one level up, the editing made it better. So when the film was almost ready, we knew that whatever we have invested in the film that much we will reap. The film looked entertaining, but we did not know it would do so well and connect with the audience so much. People unanimously loved it. Anil Kapoor told me he liked the film. There were lots of tweets about the film. Rahul Dholakia (who directed Raees) tweeted that there should be a special award for Stree. People all over have liked it and its viewership increased by word of mouth. Did you get negative feedback? Yes, we did. I think it is necessary for a film to get negative feedback. Some said they did not like the songs, some said we are talking about feminism in the film and we have shot an item song Kamariya with Nora Fatehi. Some people did not understand the end of the film. I kept the ending that way so we could make a sequel. We had planned that if people start talking about the film and its climax, and if it connected with people, then there were reasons to make a sequel. My film was ready, but I added the bus scene to create curiosity, a hint for a sequel. We did not write a sequel, but we kept thinking what could be there in part two. Our writers Raj and DK (Raj Nidimoru and Krishna DK, also the film's co-producers) had an idea that we could make the film in two or three parts. But till the time the first part was not released we did not want to talk about it. We had decided that if the audience liked Stree, then after two or three years we would plan a sequel. Because of the kind of reaction we received for the film we have already started work on it (the sequel). 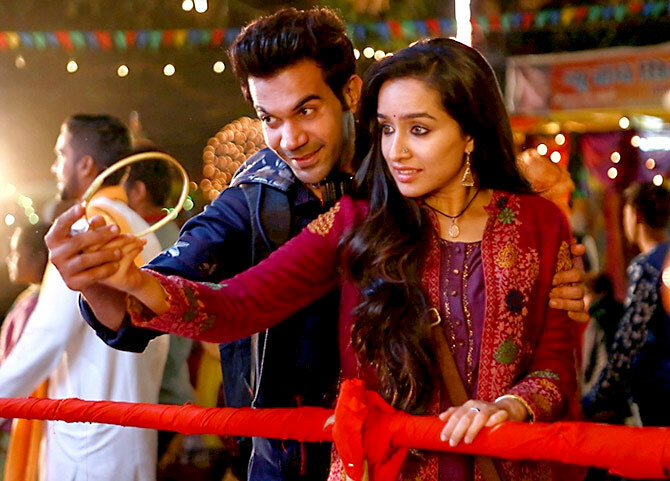 Shraddha Kapoor's character is ambiguous -- is she a witch, a ghost, or a human who later becomes Stree? I have kept it open. I will clear it in part 2. We did not want to reveal if she is a witch, a ghost hunter or just a human being. There is a subtle hint in the film. Horror comedy as a genre has not been explored in Bollywood films. How did you think of making one? When Raj and DK told me the gist of the story and asked if I would like to direct it, I agreed because it was different. For my debut feature film it had that uniqueness. I knew nobody knows me now, but if the film clicks everybody will know me. If it doesn't work, I will be back at square one. I had nothing to lose, I had no baggage or fear. My producers told me to make the film the way I wanted. I had already signed my second film so I wasn't worried. When we mix two genres in a film, then the film is neither here nor there, like say rom-com. The balance has to be right. Most of the time that doesn't happen. The balance is off. Therefore, people want to either make drama, horror or comedy. They don't want to mix genres because there is a worry it may not work. Every genre has its day. Everybody was once making rom-coms. Then my producers (Raj and DK) made zombie comedies. Two films were made in the genre. Nowadays everyone is making biopics. Now (after Stree's success) people may start making horror comedies. Your story is inspired by the southern folk tale Nale Ba (Come Tomorrow). You shifted the story from the south to the north. How much did you have to change? Raj and DK told me it is a story from Tirupati where it is called O Stree, Repu Raa (Hey lady, come back tomorrow). All these beliefs are all over India. Some write Om outside their house, some have a horse shoe outside their homes to ward off evil. When Raj and DK asked me, 'Where do you want to base the story?' I could only think of the north because I know the nuances of the place I belong to. I also wanted the film to have shudh Hindi. Words like nimnlikht, uchcharan, which is missing nowadays from films. Hindi has a different twang in different places like Kanpur and Bhopal. I did a recce of many places. I went to the mountains because mostly in India horror films are shot in hilly regions. But we decided all the ghost stories we have heard are from where we have lived and in our houses, so we thought of keeping it in a town. As a child I once passed Chanderi and lived there for the night. It was very eerie. Suddenly, while doing recce for this film, I remembered Chanderi and thought of going and checking it out again. When I arrived, I thought it was the perfect place. First, no film had ever been shot there. I wanted the residents to give their town's name for this film. I did not want a fictitious town. There are underlying messages in Stree. Can you elaborate on them? The kind of cinema I have come from, I wanted to make a meaningful film. Whether it is comedy or horror, it should have social relevance. I did not want it to be preachy. All the films of the '70s, '80s and '90s have the issues of those times in them. I thought we should talk about women empowerment. Also, because our film's name is Stree, we can't only have jokes in the film. Pankaj Tripathi is brilliant. How did he come on board? 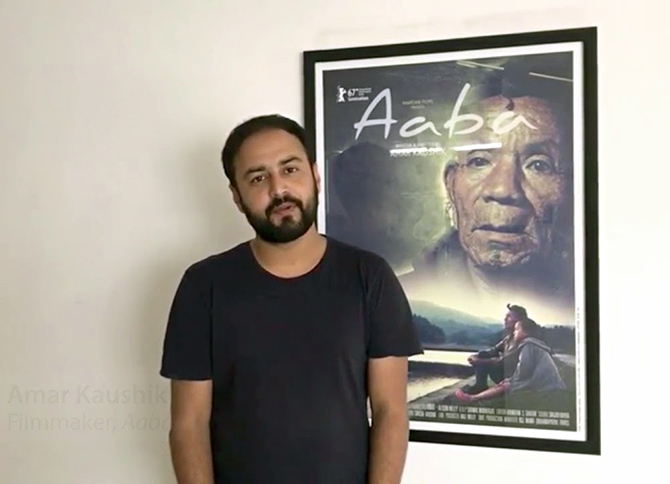 My short film Aaba went to the Berlin film festival. His film Newton was at the same festival. We met there. He said I have heard you went through a lot of hardship to make Aaba. I want to see it. He liked it a lot. We spoke about the film a lot, then I told him whenever I make my first feature film I would like to work with you. When we were writing the film and there was the character of Rudra who knows everything, I decided that no one other than Pankajji can justify this role. When I approached him, he did not say yes immediately. After he heard the story he was not very sure. Then he heard the script and dialogues. After three meetings he agreed and he put in his 100 percent. Every actor speaks about your style of direction -- like how you lighten the mood on set and play songs. Why did we come in this field? We did not want to do 9 to job, right? But we are shooting 9 to 9 and since I have been an AD (assistant director) for almost ten years I have seen there is too much tension on the sets. There is no fun on the sets. When I was an AD, I would joke on the sets, play the joker. To make people comfortable, so that people laughed. I had decided that whenever I became a director I will lighten the atmosphere on the sets. Our film was a comedy, therefore we needed good chemistry between the actors. Good dialogues should be delivered well. The friendship and bond had to come across. When I was an AD, there was a section called 'Thought of the day' on the call sheet. We would search Google and add it. I thought it was a fake section, so I made it 'Song of the day'. We would play the song according to the scene situation of that day's shoot. 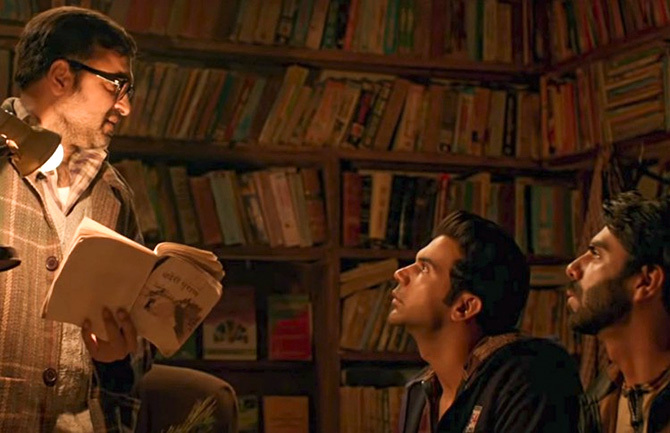 Like there is a bookstore scene in the film. Our song of the day was Kitaben Bahut Si Padhi Hongi Tumne (Baazigar). For Shraddha's scene we played the song Dream Girl, Kisi Shayar Ki Ghazal (Dream Girl). We would play the song at the start of the shoot. Everybody would dance and get into the mood of the shoot and forget all the tension. It was like meditation to get everyone charged for the day's shoot. Were films always a career choice for you? I was born in Kanpur, but I have been brought up in Arunachal Pradesh. My father was a forest ranger. My mother was a teacher. Both are retired. I have a younger brother and sister who live in Chandigarh. My parents wanted me to be an engineer, they sent me for the entrance exam. I did not write the paper. My father came to know that I had handed in a blank answer sheet. I got a pasting. I was always a story teller. A small incident and I would make up a huge story. We had a VCR in our house. The place we then stayed in mostly did not have proper electricity. It would come and go often. To finish watching a film on VCR would take a week. I would narrate the film's story to my friends in school. From the point the electricity went off I would make up the film's story. When I watched the film next it would be something different from what I narrated. That gave germ to my telling stories. When we shifted to Kanpur I started watching lots of theatre. I started watching first day first show films. We did not have access to international films. I just watched Bollywood films. I joined a theatre group in Kanpur and took care of the back stage. I wanted to get into the film line. After Class 12 when I told my parents that I wanted to go to Mumbai, the atmosphere in the house changed. My parents were upset, they thought I wanted to be an actor. I had to complete my graduation. I worked as a pager salesman and sold holidays to people in Kanpur. Then I told my parents I wanted to be a journalist. I went to Delhi, did my Mass Comm, and from there I came to Mumbai. I had some Rs 20,000 in hand because of the jobs that I did in Kanpur. After coming to Mumbai, what did you do? I came to Mumbai and stayed at a friend's friend's house. I did not know this person directly. He stayed in Thane (a city adjacent to Mumbai). I reached in the morning. I asked him about studios, he told me there are many in Andheri (north west Mumbai). By the afternoon I took a train and left for Andheri. I asked someone at Andheri station about where the studios were. He told me to go to Sagar Arts. I reached and discovered it was Ramanand Sagar's studio. The security did not allow me to go inside. I made up a story and somehow I got entry, I saw people wearing monkey masks and jumping around. They were shooting a new show. I told I had just finished my journalism course, that I could write. I got a job on my first day in Mumbai. I was an assistant director! My work was taking printouts, getting the extras ready... all the basic work I was doing. I worked there for two months. I never got paid. I had no expense because I was staying at a friend's friend's house. I ate on the sets, I travelled by train and walked around mostly. So my cost of living was just 3,000 rupees a month. After that I joined Miditech. Again, I was put on internship because my job profiles at Sagar Arts and Miditech were different. Again, I had to work three months without pay. By now I was running out of money. I had shifted to Andheri. Four people, one room, Rs 500 rent for a month. The others worked at call centres and my coming at odd hours disturbed them. One day I lost that house too. I was travelling by auto and asked the driver where he stayed. He told me he stayed at a place in Juhu (north west Mumbai). I asked him to take me there. It was a huge hall with 15 beds and a cupboard. I had to pay just Rs 70 per night. Only one bathroom though and that was tough. That autorickshaw driver became a dear friend. He would drop me to office and pick me up. He has gone back to UP now. At Miditech I worked on Indian Idol, then on the serial Parivaar. My monthly salary was Rs 3,500. I was hardworking. I would stay in office very late as I had no friends, no relatives, no good house so I would take other's work and do that too. I would take interest in post production work. They saw I was very honest, so I was given the job of post production supervisor. My salary went up to Rs 25,000 in six months. After 3 months I got bored. 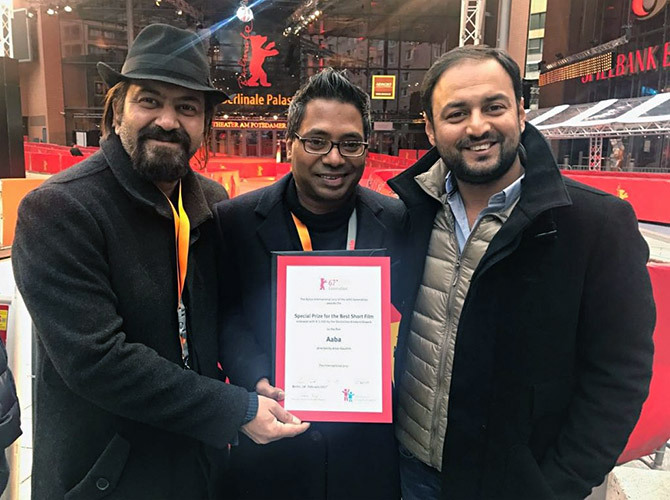 IMAGE: Mithul Dixit, left, and Rajkumar Gupta, centre, who produced Aaba, and Amar Kaushik, who directed the award-winning short film. How did you get to work on films? I heard that Miditech was the line producer for the film Aamir. I went to my senior and asked if I could be an assistant director. Only if the director (Rajkumar Gupta) agreed, he said. I got the job, but I got a salary demotion. I was now paid Rs 8,000. I had savings of Rs 75,000 by now. But I had started staying in a good house. It was a one-and-a-half BHK on a twin sharing basis. The salary demotion made it tough. I was the last AD on Aamir, but I worked hard. I did the recce for all the locations. After Aamir I kept getting more work and never went back to television. On Aamir, most of Anurag Kashyap's crew members like Vasan Bala became close friends. Vasan told me to go and meet Onir. Onir took me on board, but there was no money. I was given Rs 6,000 for Sorry Bhai. They were shooting in Mauritius, so I could not resist. After the shoot ended, I told them I would like to work on the post production too. I wanted to learn. I got a salary hike -- Rs 15,000 -- for doing post production. From then on, there was no looking back. I was getting good work with Rajkumar Gupta and Onir. On No One Killed Jessica I was made associate director. From there on, there was only progress. 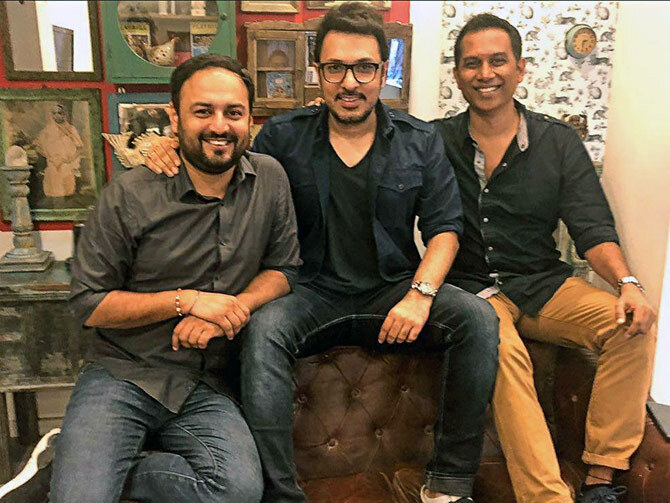 IMAGE: Amar Kaushik, left, with Dinesh Vijan, centre, who co-produced Stree, and Raj Nidimoru, who co-wrote and co-produced the blockbuster. When did you think you want to direct? I enjoyed being an AD. I wanted to learn, so I did that for 10 years. I was learning a lot. Then people started telling me I should direct now. Directors and editors started acknowledging my work. So I started writing stories. I wrote two stories which Rajkumar Gupta rejected. He liked the third one and asked me to work on it, that was called Chor Nikal Ke Bhaaga. When I went to production houses they would hear the story and like it. But because I was a first timer, no one would allow me to direct the film. So I decided to make a short film Aaba to showcase my work. Rajkumar Gupta produced it. My friend Mithul Dixit put in some money. I went to Arunachal Pradesh to shoot the film. Aaba is the story of a grandfather and granddaughter, it has very few dialogues. After the movie was complete, Onir saw it and suggested we send it to film festivals. In Berlin it won the award for best short film. Aaba has won 25 awards and gone to 100 festivals. I won the National Award for it. After that, people started thinking I make art films so again there was a problem getting work. At one screening Raj and DK approached me with their story Stree. We had worked together on Go Goa Gone. I met (producer) Dinesh Vijan and he agreed to produce it. Work started on the film. On day one of the shoot the call time was 9 am. I reached at 7 am. I was very emotional, everything came back in front of my eyes. 200 people were watching me when the first shot was okayed. On August 28, 2006, I reached Mumbai. I have the train ticket still. My first print came out on August 28, 2018. It took me 12 years to have my first baby.